PITTSBURGH -- James Neal is more than the accomplished wingman the Pittsburgh Penguins long coveted to help elite center Evgeni Malkin get back to the top of his game. More than an accomplished scorer who can carry a team through long stretches of a six-month season. More than an ego-free player who doesn't mind adapting or altering his own game if it helps make his linemates better. "NHL 36: James Neal" will debut at 6:30 p.m. Eastern on Wednesday in advance of the Maple Leafs-Penguins telecast, and will re-air at various times on Wednesday, Thursday, Friday, Sunday and Monday. The NHL Network also will air the show in Canada and the United States on March 11, 14, 17 and 18. NHL Original Productions cameras followed Neal for the show, the latest collaboration between the NHL and executive producer Ross Greenburg -- the alliance that produced two critically acclaimed programs on HBO: "Broad Street Bullies" and "24/7 Penguins/Capitals: Road to the NHL Winter Classic." NHL Original Productions develops long- and short-form programming for the League's media partners, NHL Network and NHL.com, as well as for national and regional rights-holders. James Neal is the Penguins' safety net. During an unpredictable season in which the Penguins have remained among the NHL's elite teams being without injured stars Sidney Crosby, Kris Letang and Jordan Staal for extended stretches, Neal has been the Penguins' one start-to-finish constant. He was acquired more than a year ago to add a complementary scorer to Crosby's line -- a role he has yet to play. Instead, Neal has often found himself cast as the front man this season as the Penguins (39-21-5) have shaken off injury after injury to produce the Eastern Conference's second-best record. With 30 goals and 32 assists in 65 games, Neal and his nearly point-per-game pace have provided the Penguins with enough resiliency to withstand the kind of devastating injuries that can doom a season. Of course, that's the side of James Neal the Penguins' fans see on a nearly nightly basis -- the goal-producing right wing on the Malkin line that also includes left wing Chris Kunitz. 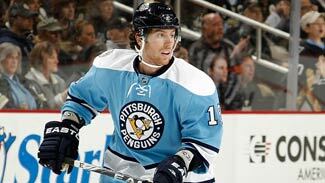 The "other" James Neal -- call it the private side of No. 18 -- will be revealed in "NHL 36: James Neal," an all-access series that will debut Wednesday night on NBC Sports Network. The show documents 36 hours in the life of Neal, on and off the ice, during a weekend in which the Penguins beat the Tampa Bay Lightning and Columbus Blue Jackets in back-to-back home games. Earlier that same week, Neal signed a $30 million, six-season contract with the Penguins. The timing, just before the NHL trade deadline, isn't a coincidence. Last season, Neal was one of the highest-profile players involved in a deal occurring near the deadline, and he struggled at first, scoring only one goal in 20 games with Pittsburgh. All that has changed this season. "I think it went well," Neal said. "We have a fun atmosphere and a fun dressing room, and it should give fans a chance to see what goes on inside the locker room and everyday life with me. I think it will be cool to see." Penguins forward Pascal Dupuis, while not wanting to reveal any of the show's subplots, said fans will especially enjoy a scene in which Neal pulls out of the team parking lot, only to discover he is toting some extra baggage. "I should have been smarter and checked my car," Neal said. Having extra cameras documenting their every move wasn't a distraction to the Penguins, who became accustomed to such attention during last season's filing of the Emmy-winning "24/7 Penguins/Capitals: Road to the NHL Winter Classic." But Neal had yet to join the Penguins by then, so this was something new for him. "You want to be yourself and do everything you normally do," Neal said. "You've got to feel comfortable and get used to the cameras in your face." The only surprise to Neal was that it went so quickly, in part because of the back-to-back games. "It's quick, it's 36 hours, and they're here and they're gone," Neal said. "We had two good games, so that it made it that much better. And they're pretty much with you for every move -- when you're at the rink, when you're at home and doing your own thing." "NHL 36: James Neal" is expected to show how Neal has adapted to playing on Malkin's line -- not an easy assignment for even a veteran player, especially given how relentlessly the line cycles the puck, waiting for the one opening that Malkin can expose. "Geno wants the puck a lot and plays with a lot of speed," Neal said. "So you try to find areas where you can help him, whether it's on the forecheck or getting to a shooting area. You read off each other. He's unpredictable, he can make any move at any time, but you couldn't find a better centerman." Coach Dan Bylsma said Neal's unselfishness is a key not only to his effectiveness, but to the Penguins' ability to generate so much offense with their top line. Since Dec. 10, or five days after the sidelined Crosby last played, the Kunitz-Malkin-Neal line has combined for 121 points (53 goals, 68 assists), or an average of more than three points per game. The line also has 53 of the team's 115 goals during that time. Malkin, coming off an injury-shortened 2010-11 season in which he produced a career-low 15 goals in 46 games, has bounced back in a big way with 38 goals and 81 points in 58 games -- in part because of the obvious comfort level he has playing with the same linemates each night. When Malkin was forced to sit out seven games early in the season as he recovered from offseason knee surgery, Neal propped up the Penguins' offense with five goals. "Geno's always a guy who's going to have the puck on his stick," Bylsma said. "He wants the puck. He'll go get it. He'll have offensive zone shifts where he has it on his stick what seems like a majority of the time. We need a player to complement him and get open and get in spots, find spots, read that. It's not always the easiest thing to do for a player, but James Neal's really been able to read off Geno, to find areas for him to have the puck and not be in his way." Neal didn't score Monday night against Phoenix and his former coach Dave Tippett, who was Dallas' bench boss during Neal's 24-goal rookie season in 2008-09. Tippett isn't surprised that Neal has been so successful or looks so comfortable in Pittsburgh. "The thing that makes Nealer special is that there are a lot of players who get an opportunity (to play with a player like Malkin), but there aren't many that take advantage of it," Tippett said. "Nealer has really taken advantage of it. He's a good player and a good person." Just as "NHL 36: James Neal" will show.